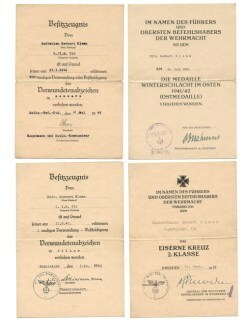 WH (Heer) Award-Document Grouping from Obergefreiten 'Walter Landskron', he was a member within the '12.(s. )/A.R.28' (Stabsbatterie Artillerie-Regiment 28). Consisting of the Award Documents for the Krim Campaign Shield and the War Merit Cross 2nd Class. Interesting grouping! 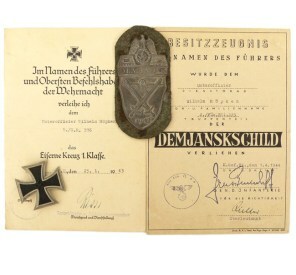 WH (Heer) Award-Document Grouping from Jäger 'Erich Dierks', the set is consisting of 2 Award-Documents for the Infantry Assault Badge in Silver and the Close Combat Clasp in Bronze. Nice original set of award documents! 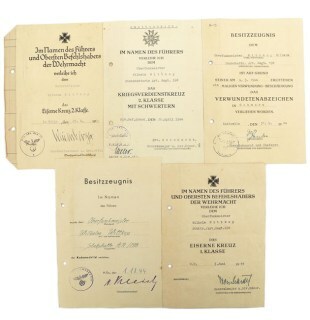 WH (Heer) Award-Document Grouping from Obergefreiten 'Franz Hocke'. Consisting of the Award Documents for the DRL Sports Badge in Silver and the Ostmedal. Nice original documents! WH (Heer) Award-Document Grouping from Oberfeldwebel 'Albert Bülow', the set is consisting of 2 Award-Documents for the Wound Badge in Gold and the Iron Cross 1st Class. Nice original set of award documents! 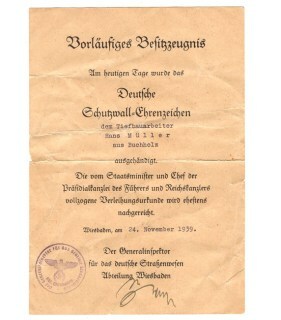 Award Document (Urkunde) for the Westwall Medal. 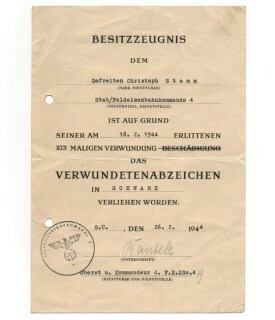 This (A5 sized) document was awarded to Tiefbauarbeiter 'Hans Müller', handed out by the 'Generalinspektor für das deutsche Straßenwesen Abteilung Wiesbaden'. Rare variant! SA Sportsbadge in Bronze Award Booklet (Urkunde), complete with matching cover. Awarded to 'Heinrich Scherer', complete with nice portrait-photo. He was awarded the SA Sportsbadge in Bronze with individual number '001504446' on 17 May 1939. Nice original booklet in very good condition! This is a nice Wehrmacht (Heer) Photo-album (Fotoalbum) from a member within the 'Panzer-Abwehr-Abteilung 30', stationed in Lübeck. He took part in the return of the Sudetenland. Included is his Award-Document for the 1 October 1938 Medal. Nice and decorative original photo-album! 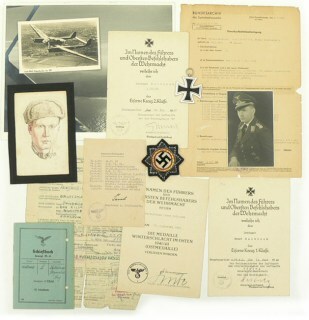 Luftwaffe Award-Documents of Unteroffizier 'Paul Wenkel', who was a member within the '1.Batterie I./Flakregiment 52'. Including the documents for the KVK 2nd Class and the Ostmedal. Nice original set! 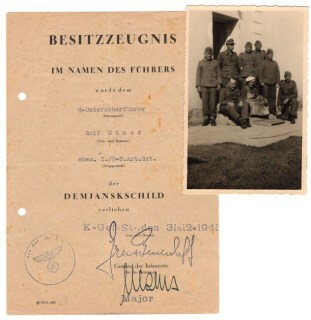 Waffen-SS 'Demjanskschild' Award-Document (Besitzzeugnis) and photograph. Awarded on 31 December 1943 to ᛋᛋ-Unterscharführer 'Rolf Minor', he was a member within the 'ehem. I./ᛋᛋ-T.Art.Rgt.' (SS-Totenkopf-Artillerie-Regiment). Rare original award-document in good condition! 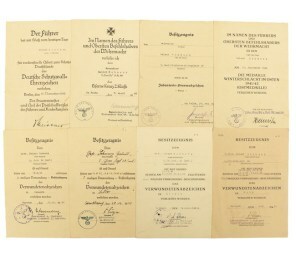 WH (Heer) Award-Document Grouping from Hauptmann d.R. 'Dr. Bernhard Lammers', he was a member within the '7./Gren.Regt.157'. 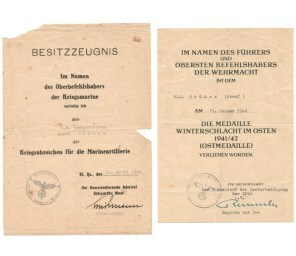 Consisting of the Award Documents for the German Cross in Gold and the Woundbadge in Silver. Nice original documents! 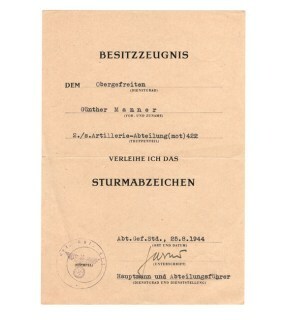 Award Document (Urkunde) for the General Assault Badge (Allgemeines Sturmabzeichen). This (A5 sized) document was awarded to 'Obergefreiten Günther Manner', he was a member within the '2./s.Artillerie-Abteilung (mot)422'. Nice original document in very good condition! Formal Knight's Cross of the Iron Cross Document (Verleihungsurkunde zum Ritterkreuz des Eisernen Kreuzes) in Folder (Ritterkreuzmappe) as awarded to Oberst "Karl Specht" on 8 September 1941, personally sigend by 'Adolf Hitler'. Extremely rare original piece of history! War Merit Cross 2nd Class (Kriegsverdienst Kreuz 2. 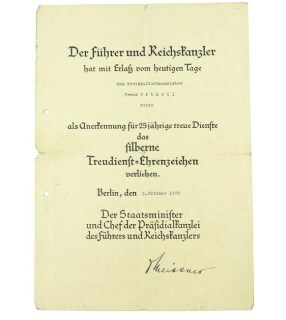 Klasse mit Schwerter) Award Document (Urkunde). Awarded to 'Oberzollsekretär Wilhelm Becker'. 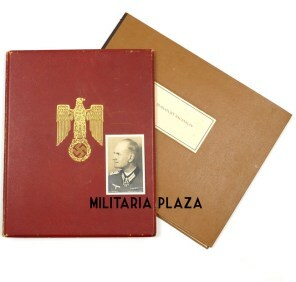 The document is personally signed by Generalfeldmarschall 'Wilhelm Keitel'. Nice original award-document! 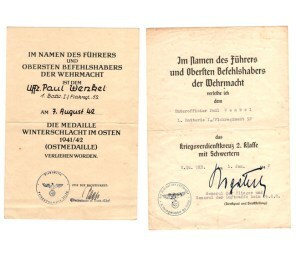 Wehrmacht (Heer) medal & award document-group of 'Sanitäts-Feldwebel Alfred Großer'. Including his Krim Campaign Shield, Ostmedal, War Merit Cross 2nd class and Romanian Kreuzzug Medal, including most of his award-documents. Interesting original grouping! Twenty-five Years Faithful Service Medal Award-Document (Urkunde). Awarded to 'Pauline Metzel' on 1 October 1939. The DIN-A4 sized award document is in unfolded condition, nice example in good used condition! Mothers Cross in Bronze Award-Document (Ehrenkreuz der Deutschen Mutter Urkunde). Awarded to 'Pauline Metzel' on 1 October 1939. The DIN-A4 sized award document is in unfolded condition, nice example in good used condition! 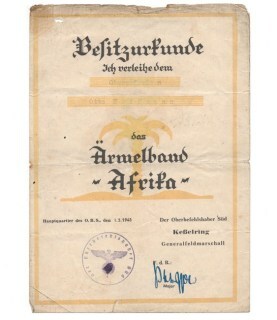 Luftwaffe 'Afrika' Cufftitle Award-Document (Besitzurkunde für das Ärmelband "Afrika"), awarded to Obergefreiten 'Otto Hoffmann'. The document is dated 1 May 1943. The document has been folded once and is showing clear traces of usage. Nice and decorative original document! WH (Heer) Award-Document Grouping from Unteroffizier 'Herbert Klemm', he was a member within the '2./Gren.Rgt.552' (Grenadier-Regiment 552). 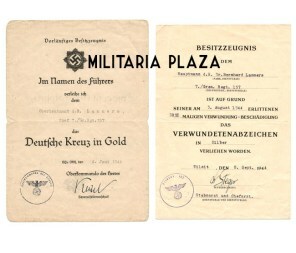 Consisting of the Award Documents for the Iron Cross 2nd Class, Ostmedal and the Wound Badge in Black & Silver. Interesting grouping! 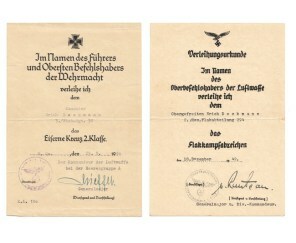 Luftwaffe Award-Document Grouping from FLAK Unteroffizier 'Ernst Oberdörster'. 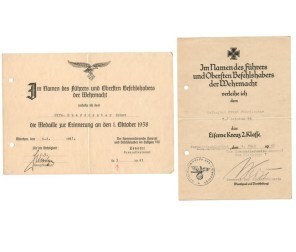 Consisting of the Award Documents for the Iron Cross 2nd Class and the 1 October 1938 Medal. Nice and interesting original award-documents! 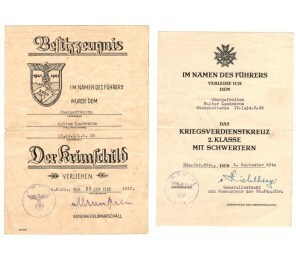 Kriegsmarine 'Zerstörer-Kriegsabzeichen' (Destroyer War Badge) award-document (Verleihungskurkunde), awarded to Matrosengefreiten 'Helmut Chlebusch' - Torpedobootes "TA 14". 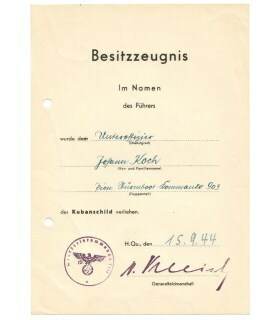 The document is signed by 'Konteradmiral Leo Kreisch'. Nice original award document! Kriegsmarine Coastal Artillery Award-Document Grouping from Marine-Artillerie Obergefreiten 'Josef Grünen. Consisting of the Award Documents for the Coastal Artillery War Badge and the Ostmedal. Nice and interesting original late-war documents! WH (Heer) Award-Document Grouping from Gefreiten and OT-Meister 'Franz Borowzyk', he was an Organisation Todt Member. 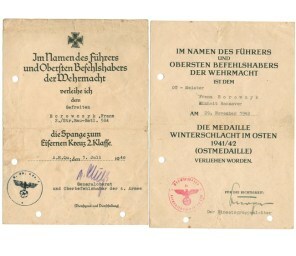 Consisting of the Award Documents for the Spange to the Iron Cross 2nd Class and the Ostmedal. Nice and interesting original documents! German Cross in Gold (Deutsches Kreuz in Gold) grouping to 'Friedrich Ernst Halbrock'. Grouping including some of his award documents, Iron Cross 2nd Class and a cloth version of the German Cross in Gold. Interesting grouping! Nice set consisting of an original 'Demjansk' Shield and Iron Cross 1st Class with their Award Documents, both awarded to 'Unteroffizier Wilhelm Höpken' who was a member within the '2./Füs.Btl.225'. Nice original set in good used condition! Black wound badge (Verwundeten Abzeichen in Schwarz) Award Document (Urkunde). Awarded to 'Gefreiten Christoph Stamm', he was a member within the 'Stab/Feldeisenbahnkommando 4''. The document was awarded on 26 February 1944. Interesting original document in good used condition! 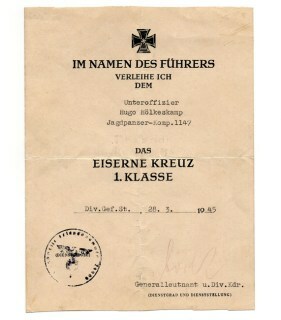 Iron Cross 1st Class Award Document (Urkunde). Awarded to 'Unteroffizier Hugo Hölkeskamp', he was a member within the 'Jagdpanzer-Komp.1147' (47.Volksgrenadier-Division). The document is personally signed by Generalleutnant 'Max Bork'. Interesting late war award-document! WH (Heer) Award-Document Grouping from Unteroffizier 'Erwin Schiemann', he was a member within the '1./A.R.240' (Artillerie-Regiment 240). 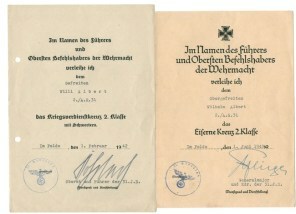 Consisting of the Award Documents for the Iron Cross 2nd Class, Ostmedal, Krim Campaign Shield and General Assault Badge. Interesting grouping! 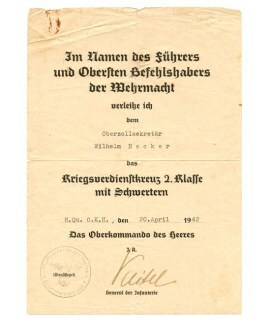 Luftwaffe Award-Documents of Obergefreiten 'Erich Deckmann', who was a member within the '3./Flak-Regiment 36'. 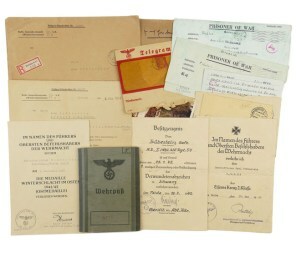 Including the documents for the Flak Artillery War Badge and the Iron Cross 2nd Class. Nice original set! 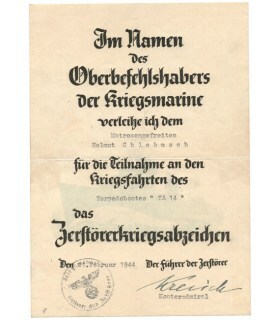 Kriegsmarine 'Kriegsabzeichen für Minensuch-, U-Boot-Jagd und Sicherungsverbände' (minesweeper war badge) award document (Urkunde). The document is personally signed by Konteradmiral 'Kurt Böhmer'. Nice original Kriegsmarine award document in good condition! 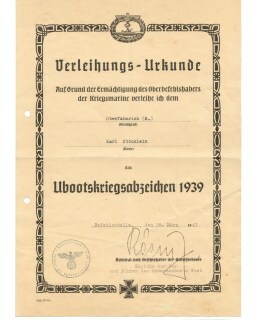 'Kubanschild' Award-Document (Besitzzeugnis). Awarded on 15 September 1944 to Unteroffizier 'Johann Koch', he was a member within the 'Pionier Sturmboot-Kommando 903'. Nice original award-document in very good condition! 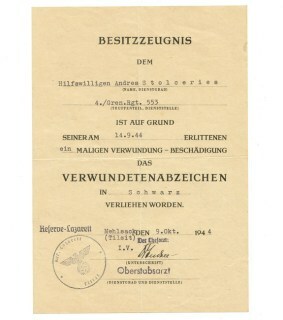 Kriegsmarine 'U-boot-Kriegsabzeichen' (U-Boat War Badge) award document (Verleihungs-Urkunde). The A4-sized document was awarded to 'Oberfähnrich Karl Stöcklein' on 28 March 1943, facsimile signed by Hans-Rudolf Rösing. Nice and hard to find original U-boat War Badge award document! WH (Heer) Award-Document Grouping from Oberfunkmeister 'Wilhelm Wittkop', he was a member within the 'Stbttr./Art.Regt.198'. 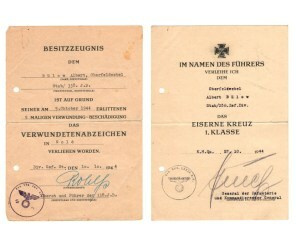 Consisting of the Award Documents for the Iron Cross 2nd Class, KVK 2nd Class, Wound Badge in Black, Iron Cross 1st Class and Kuban Campaign Shield. Interesting grouping! Black wound badge (Verwundeten Abzeichen in Schwarz) Award Document (Urkunde). Awarded to Hiwi (Hilfswilligen) 'Andres Stolceries', he was a member within the '4./Gren.Rgt.553'. The document is dated 9 October 1944. Rare original document in good used condition! 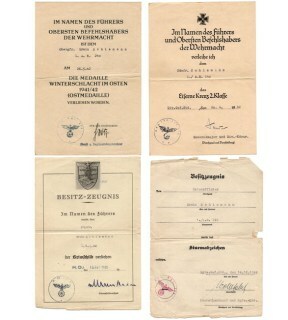 Luftwaffe Award-Document Grouping from Unteroffizier 'Arthur Reckel'. 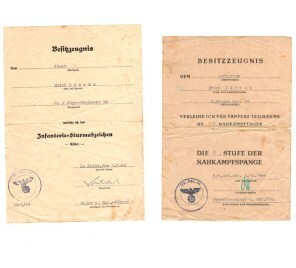 Consisting of the Award Documents for the 1 October 1938 Medal, a Wound Badge in Black and the Air Gunner Badge (Fliegerschützen). Nice original Award-Documents!